Triple C Charters: It's Alive!! The fishing has been nothing short of amazing the last couple weeks! We've seen our first cool fronts push through the area which has finally given us a reprieve from the heat and humidity of the late summer. It has also lowered the water temps into the low 80s where many of our gamefish are most comfortable. We have plenty of bait around and when conditions are right, they are feeding heavily, and the bay is alive!! 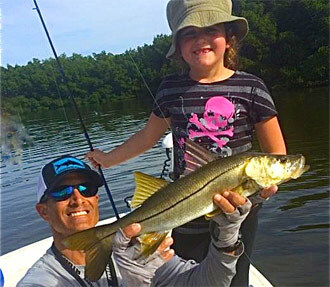 The spanish mackerel can be seen skyrocketing as they blow up baits in the shipping channel and there are snook under just about every stretch of mangrove with good current flow. We even jumped a small tarpon while snapper fishing! When the tide is moving these fish have been going nuts! Late summer redfish schools are pouring into the upper bay. Usually easy to spot but they have been skittish because of so much pressure. Once they settle down in a cove, or in a low tide trough, a cut pinfish doesn't usually last long. Trout are plentiful on the deeper grass flats and channel edges as are mangrove snapper although I expect the larger ones to be moving offshore soon. Still lots of sharks, jacks and ladyfish bending rods and testing tackle as usual. 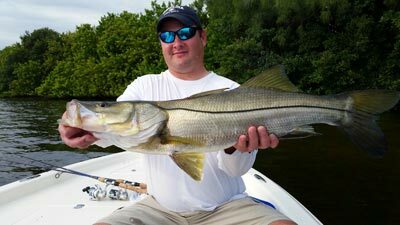 Everyone loves the sound of a screaming drag but the exhilaration and satisfaction in battling a big snook out of deep cover is hard to beat! Whatever your pleasure, get out there and get your fix!! The weather is beautiful and some of the best fishing of the year is upon us!